In Arthurian legend, Avalon is where King Arthur's sword Excalibur was forged and where he was taken to recover from his wounds after the battle of Camlann. It was reputed to be an island of extraordinary and ethereal beauty, abundant with flowering and fruiting trees. It is entirely apt therefore that this home located at the far end of Copperwood Ridge and nestled into a valley should be named Avalon. Here, once you pass through the gates, you enter into an island of verdant beauty and calm. All about are specimen trees, many that flower and many whose branches are laden with fruit. Jewel-hued flowers bob to and fro in the gentle breeze; the deep blue of the ocean lies below to the fore and to the right and rear, hills clad with velvet green tumble up and down. There are two bedrooms in the main house, both with views of the sea and those bewitching gardens. The blue-hued master bedroom has a king-size bed and the guest bedroom has twin beds which can be configured as a king. The en suite bathrooms to both bedrooms have walk-in showers and separate bath tubs. The exceptionally pretty guest cottage has two bedrooms with en suite bathrooms, one with a king-size bed and the other with twin beds which can be joined together. 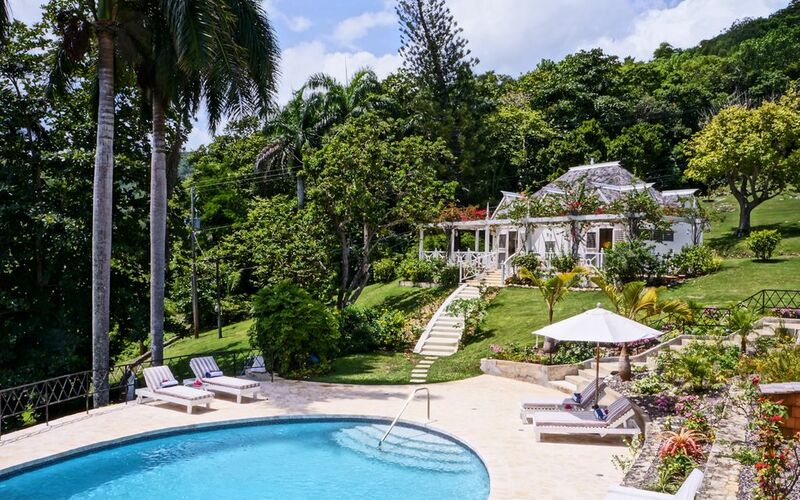 Both are light, airy and quintessentially Jamaican with extensive use of white and vibrant splashes of colour in cushions and the paintings that adorn the walls. You will be well cared for at Avalon by a butler, cook, housekeeper, laundress and two gardeners.